Papercrafts by Patti: JOY! Banner and Online Extravaganza! Free Gift for YOU! JOY! Banner and Online Extravaganza! Free Gift for YOU! First TEN orders received online will receive this JOY BANNER *FREE* from me to you! This Christmas as I look around at the word "JOY" I will smile because that is the name of my newest grandchild, who is now 8 months old! I made this banner so quickly using my Buffalo Check stamp, Stitched Labels Framelits and retired Large Letters Dies. Add a little 3/16" Braided Linen Trim to hang the banner and you are finished! You can place this on a large package, or use it on your tree. Mine is now hanging from the front of a small shelf in my studio. My inspiration came from the Holiday Catalog, pg. 8. Today begins Stampin' Up! 's Online Extravaganza. For savvy shoppers everywhere this time of year is a dream come true! 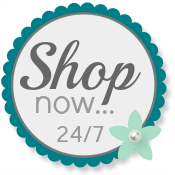 And you can shop from the comfort of your home, without crowds (wearing your jammies~)! To take advantage of the sales, please use my Online Store on any/all the given days! DON'T FORGET, I will send you this JOY BANNER *FREE* for the first 10 Online orders I receive during this promotion! It's my gift to you for shopping with me! Let me know if you have any questions. And don't forget the JOY you get from making something special for your loved ones!! !